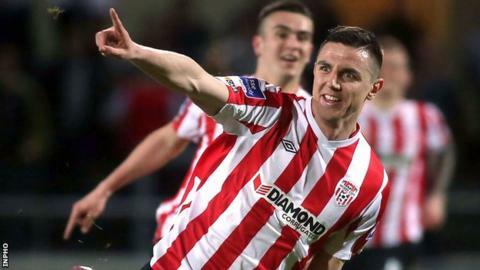 Derry City clinched their second Premier Division win of the season with a 3-2 victory over basement team Athlone Town at the Brandywell. James O'Brien swept in the opener for Athlone before Enda Curran headed home a 23rd minute equaliser. Patrick McEleney's pass set up Rory Patterson to put City ahead and the impressive Michael Duffy fired in to make it 3-1 on the hour mark. Derry held on after Jason Mark's superb free-kick into the top corner. Athlone made a bright start and Sean Brennan had his headed finish ruled out for offside before Kealon Dillon struck the City woodwork. A mistake from Derry defender Dean Jarvis let in the visitors, with O'Brien shooting into the bottom corner on 15 minutes. Derry responded quickly as Curran met Duffy's cross to head past keeper Craig Sexton. The hosts moved in front after 30 minutes, McEleney's throughball releasing Patterson and the striker rounded Sexton before slotting in. Both sides squandered chances early in the second half before Duffy rifled in at the near post to give City a two-goal cushion. Marks gave Athlone hope of a first league point when the substitute's free-kick arrowed beyond Derry keeper Gerard Doherty. Patrick McEleney blasted against a post in the dying minutes as City stayed in front to secure a win which leaves them seventh and seven points behind leaders Dundalk.